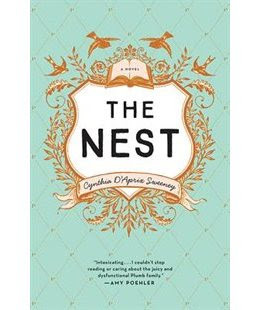 I did not attend the last book club meeting where we discussed The Nest but I did read it so I thought I would post my thoughts on the book for completeness. This was a book that seemed to be everywhere when it came out, and usually I try to avoid those types of books. There is something about books like The Da Vinci Code and the Twilight series where as soon as they are everywhere, I make a mental note to never read them (incidentally I loved the movies for those books). So if it had not been for our club choosing this book, I wouldn't have read it. My feeling about the book is "meh". It was alright, but nothing special. I don't know why everyone was so obsessed with it. I feel like I know what the author was trying to accomplish but she didn't quite get there. She wanted to create an intricate web of stories of these family members and some supporting characters in a way that urged readers to keep turning the page and be awed by how the connections fell into place. I was not awed, and I didn't care that much about the characters. They all had their faults, but little to no redeeming qualities to engage me in their outcomes. Maybe it was because the first part reminded me of something that would happen in The Affair, and then paled in comparison. Then I couldn't really take it seriously. The only part I really liked was the bit about the 9/11 statue, and that's just because I love to read stuff about 9/11. But that was really just a minor part, and we didn't even get a full resolution of it, at least not in my opinion. So you can say I wouldn't recommend it. Spend your time on another book.